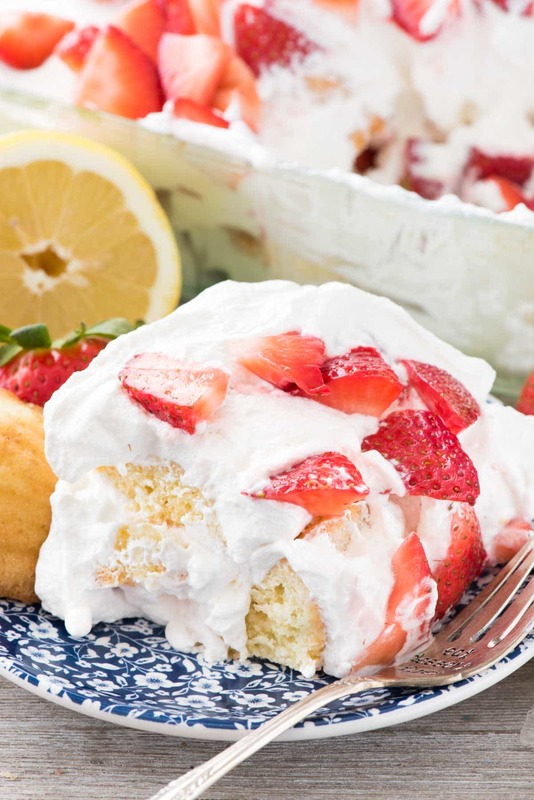 No Bake Strawberry Lemon Cake – this easy lemon cake recipe starts with lemon madeleines and is full of fresh lemon whipped cream and strawberries! Do you ever think about how, in life, things come full circle? Like how I’d always wanted to be a teacher only to do it and quit, then start teaching people online? Or how I loved to bake with my mom when I was a kid and now I love to do it with Jordan? I love it when you sit back and realize things that have come around and ended back where they started. This post made me reflect on how I’ve gone full circle in this job. Back in 2012, when I just started working with brands, my very first post was with a company called Donsuemor. They make madeleines and they contacted me about working with them on a tea party post. I set up a tea party for Jordan and her American Girl doll and made my very first cheesecake dip: White Chocolate. I showcased all the madeleines and how I’d fallen in love with the lemon ones and took some horrible photos of the food, the tea party, and the product. Fast forward 5 years and I started working with them again; this time as an ambassador. Pretty cool, right? How after all these years we came together again to make delicious desserts together? I’ll be bringing you three posts about their products this year, but I’m starting with my absolute favorite: LEMON. Their lemon madeleines are to die for; so pillowy soft with a burst of citrus and sweet. They sent me a huge box to work with and it was all I could do not to eat my way through before I had a chance to make a recipe. Even Jordan was digging in. Lemon and spring go hand in hand, and this time of year I start thinking about all sorts of no bake desserts. I just love layered no bakes because they’re so simple, can be made ahead of time, and don’t need an oven. 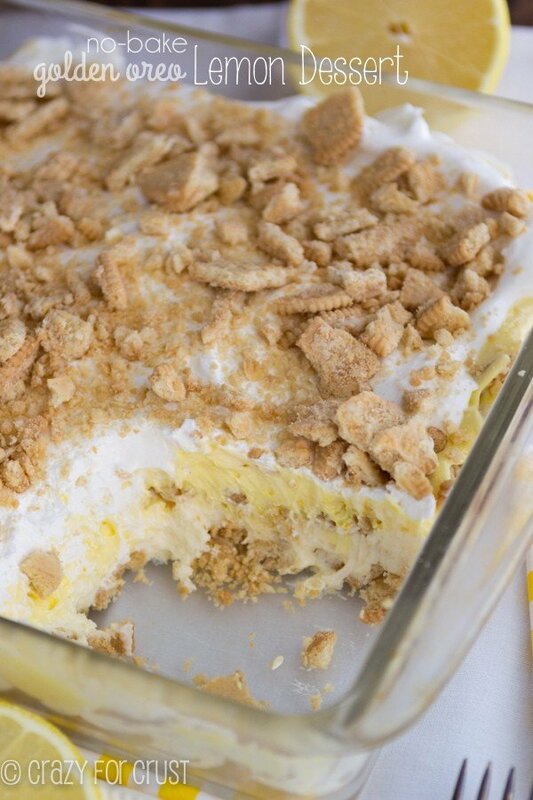 This easy dessert is similar to a layered lush recipe or an ice box cake. 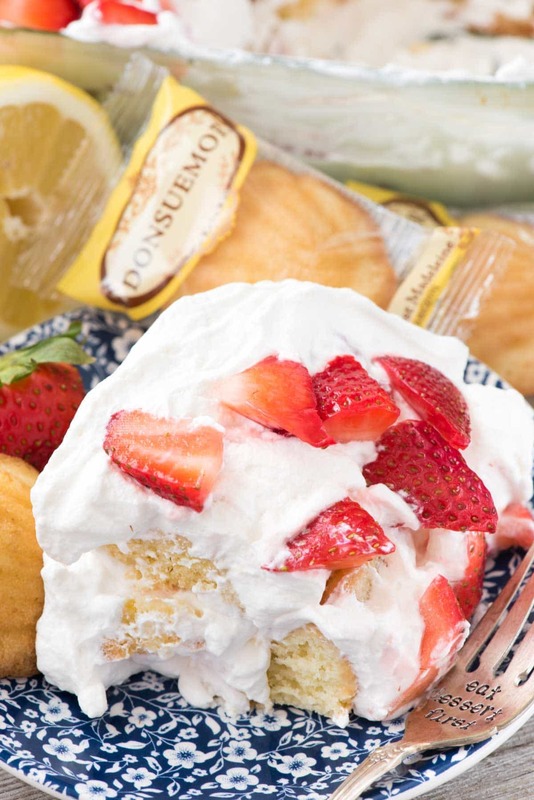 It couldn’t be easier to make with fresh strawberries, homemade whipped cream, and Donseumor Lemon Madeleines. 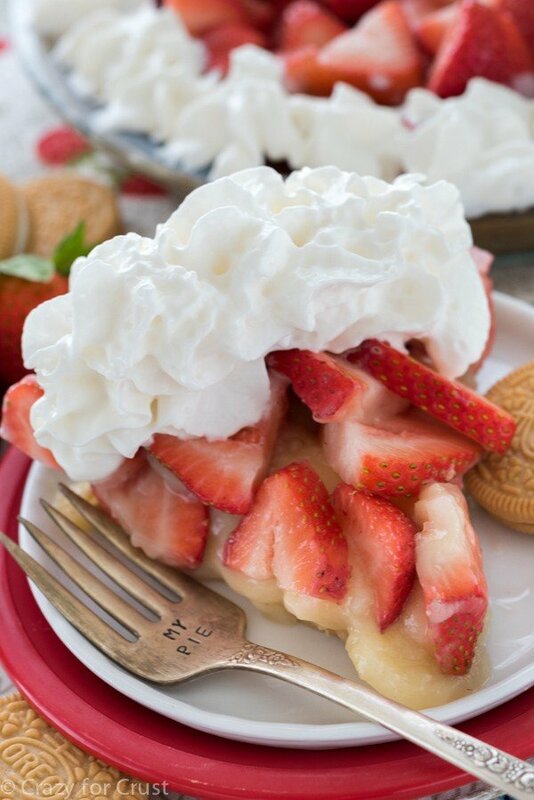 It’s a No Bake Strawberry Lemon Cake and it’s such a perfect easy lemon dessert recipe. I used 24 madeleines in a 8×8″ pan. If you need to make a bigger pan to feed a crowd, it’s so simple to expand this recipe. The fresh whipped cream is made with heavy whipping cream and sweetened with powdered sugar and vanilla and has a dash of lemon zest. The cake is layered with fresh berries, perfect for spring or summer potlucks, and goes down so easy. You can use any flavor madeleine in this recipe. Check out the Donsuemor website to find locations near you, but they’re in several grocery stores and even some Costco locations. 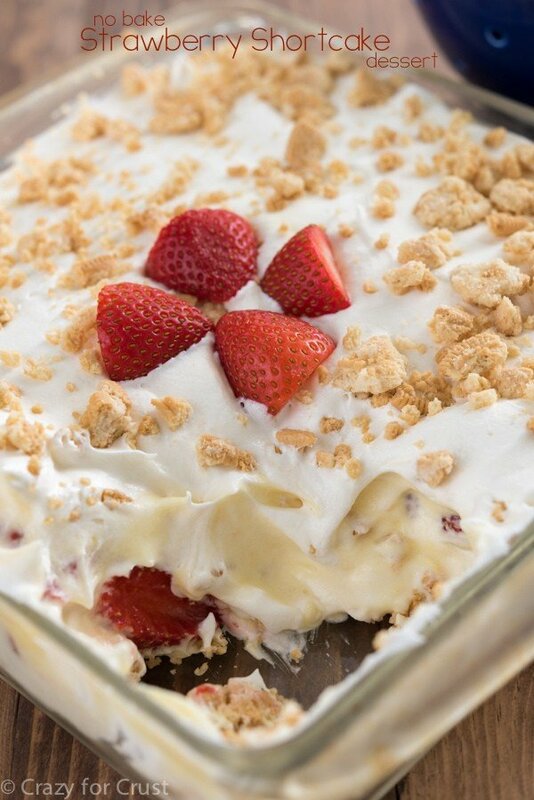 Just make sure you make enough No Bake Strawberry Lemon Cake for a crowd…its’ so easy to eat! No Bake Strawberry Lemon Cake - this easy lemon cake recipe starts with lemon madeleines and is full of fresh lemon whipped cream and strawberries! Line the bottom of an 8x8” pan with 12 madeleines. Top with half the whipped cream. Add half the strawberries and the other 12 madeleines. Top with the rest of the whipped cream and the rest of the strawberries. Cover and chill at least 1 hour before serving. Best eaten the day it’s made. This post has been sponsored by Donsuemor. All opinions are 100% my own. Where can you buy the lemon m by the Madeleine ? You can check on the website to find them near you. Check your grocery store too, to see if they sell madeleines at all. What a great full-circle story! 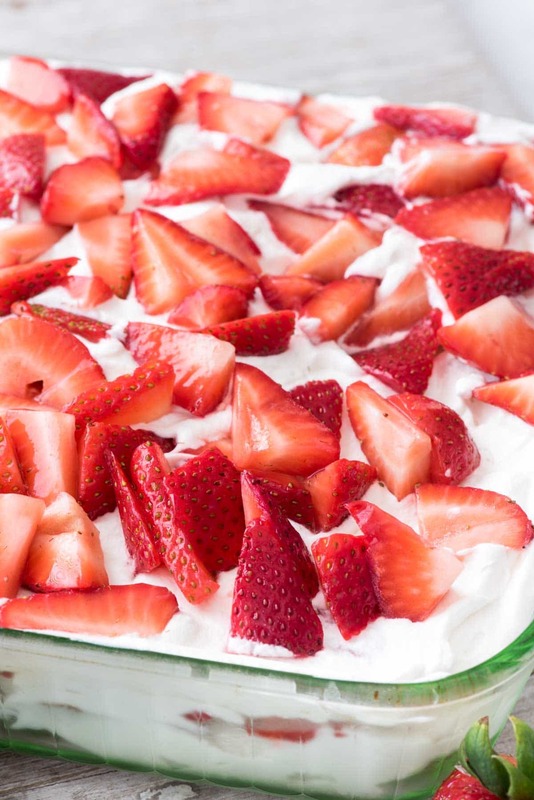 The strawberries and whipped cream are calling my name! Wow, this looks great. Love me some madeleines. Maybe all 3 of us can bake something when you are here next week. 2 cups heaving whipping cream? I think you mean HEAVY whipping cream! LOL! Wow this is one gorgeous dessert! I could eat strawberries everyday. Love how easy this is to put together. Have a terrific weekend!